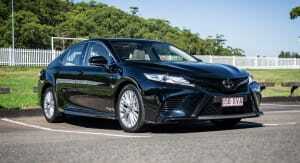 Not really practical for daily urban grind; lack of side airbags for rear passengers; enormous. 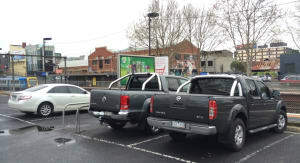 Dual-cab 4×4 utes are venturing in from the countryside and becoming more and more popular in the inner city. Not so much as working vehicles but as substitutes for the more traditional family SUV wagon. 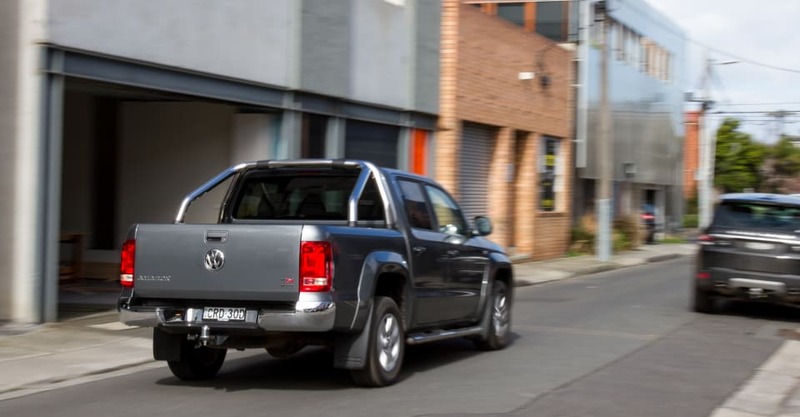 With that in mind, I spent a week with the 2014 Volkswagen Amarok TDI420 Highline to see how these real-world Tonka trucks handle the urban lifestyle. To say that all dual-cab utes live in regional areas would be grossly unfair. 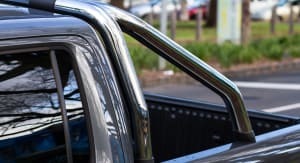 The category has been ruled by the ‘unbreakable’ Toyota Hilux for decades and four-door utes have always been a common choice for a variety of tradies and other ‘working’ drivers. However, it seems these utes are gaining popularity among ‘city folk’ as an everyday alternative to typical SUV wagons. So rather than assess the A-Rok as it was primarily intended, I am looking to see how it (and other) dual-cab utes handle daily life in town. Marketed under the premise of positively combining space, practicality and ‘car-like’ handling, many utilities also feature tax incentives and rebates for small business owners. So is this trend driven by value and functionality, or are dual-cab utes becoming a ‘thing’? Most marketing for dual cabs is geared towards lifestyle and the owner’s mix of work and play – highlighting the flexibility and freedom these machines appear to offer. Hell, even I bought into it, thinking a week in the Amarok would see me kite surfing and mounting biking with the best of them. 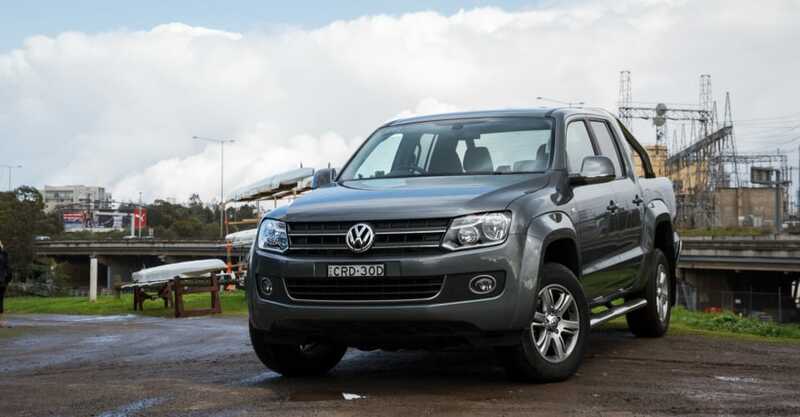 Our comparison test team currently has the VW Amarok as the pick of the dual-cab-ute crop. The Amarok is certainly great at being an effective work vehicle while also offering a relatively inviting cabin. But focusing on it as a family truckster, things weren’t feeling quite so carefree. Where I live in Melbourne’s inner suburbs, SUV wagons are a very common sight, but they’re still considered to be big cars. 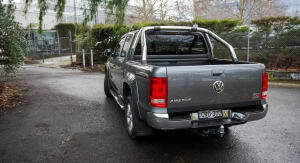 Stopping at the supermarket on my way home in the Volkswagen Amarok for the first time, though, was like having to change down a belt buckle. 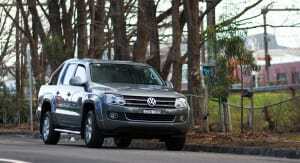 My Amarok for the week is the $55,490 (before on-road costs) TDI420 Highline and it is positively enormous. At over 5.2m long and 2.2m wide, the Volkswagen has a good 10 per cent larger footprint than my own BMW X5. 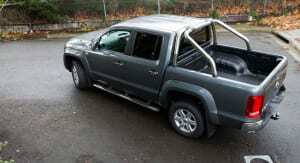 That said, the Amarok is a cool-looking truck. 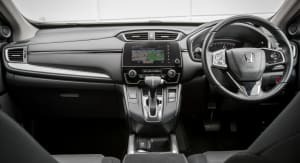 In fact, most cars in this segment – with the exception of the somewhat ‘polarising’ Mazda BT-50 – are chunky, tough and generally ruggedly handsome cars. The flared arches, chrome sports bars and high-riding stance present a strong ‘work hard : play hard’ image and I can certainly see the appeal. 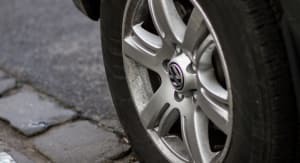 Sitting nearer the top of its model range, our TDI420 Highline features a sports bar as standard, along with side steps and 17-inch alloy wheels. Finished in ‘Natural Grey’ paint, the big ute looks classy – more building company owner than gofer with a hammer. 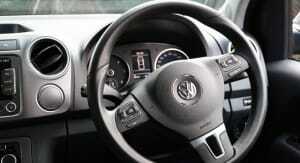 Inside, the Amarok is spacious and comfortable. 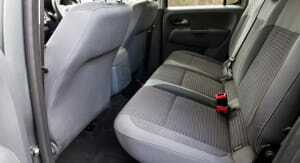 The cloth seats give good support and the elevated driving position provides great forward visibility. And I do mean elevated. If people moved from wagons to SUVs to feel higher, I can see why some are transitioning to big utes like the Amarok – it’s a skyscraper. The back seat can fold to allow more in-cabin space, but the bench isn’t the comfiest place for passengers and there are no rear-side airbags – something that most dual-cab competitors do have. The fit and finish is typical Volkswagen quality, but feels much more Transporter than Golf (read: utilitarian). 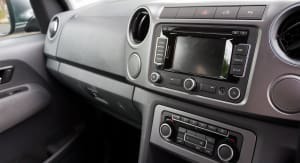 The cabin is ergonomic and simple to get used to, but the plastics are designed to be more work than play and act as a constant reminder that this is, at its core, a commercial vehicle. 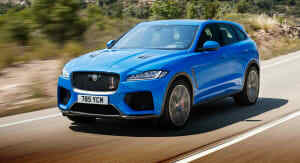 The 132kW/420Nm twin-turbocharged 2.0-litre four-cylinder diesel pulls well and easily provides adequate performance around town. Perhaps somewhat unsurprisingly, it does sound particularly ‘trucky’, though. 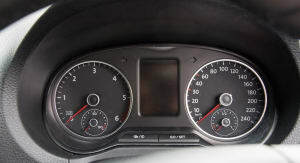 More noise is attached to the Amarok’s box-like aerodynamics with wind noise at highway speeds more than noticeable. Just as contented handling low-speed traffic and parking situations as freeway runs, the big Volkswagen proves very economical returning 8.8L/100km over our mainly urban test week (close to its 8.3L/100km claim). 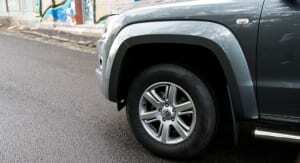 Despite its size, the Amarok is easy to drive. You can hop up high into the cab and just go. 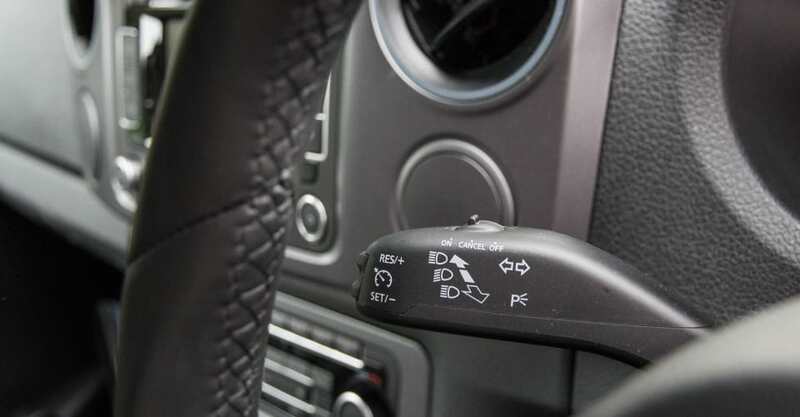 Volkswagen’s familiar switchgear makes adjusting to controls simple, and vision out is excellent. For something this big, it is almost too simple – and this is where the ‘car-like’ marketing spin works. 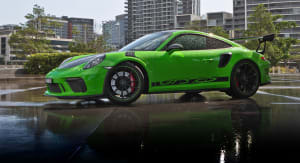 The ride around town is firm and bouncy, like a set of… well, since we aren’t a lads mag like Zoo Weekly or Top Gear, I’ll leave the obvious analogy alone. It’s still one of the more comfortable of this breed to drive. 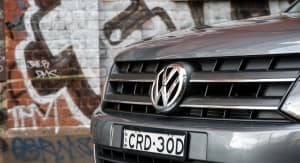 All this reinforces our high opinion of the Amarok – it is good, but how was my week progressing with the big VW as an urban-cowboy family car? In truth, not that well. Driving around town is fine, it’s parking and using the car for my day-to-day jobs that start to show cracks in the foundations. 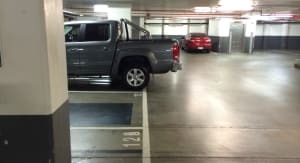 It’s not so much the Amarok’s size, but its size relative to everything else that causes frustration. The A-rok is so much higher than other cars, that seeing them while parking or manoeuvring in narrow streets or car parks can be challenging. The Highline has front and rear parking sensors with a sonar display on the five-inch touchscreen, but you just never really know how close you are to that car behind. Not with any confidence anyway. 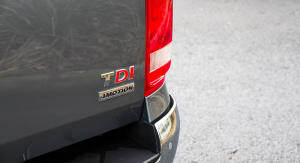 The VW is one of the rare dual-cab utes to offer rear sensors, though. Plus, finding a spot that is big enough for the thing isn’t easy either. A combination of lazy council markers and ‘Albert Parking’ means fitting in around here can be tricky, so you tend to park away from where you need to be. 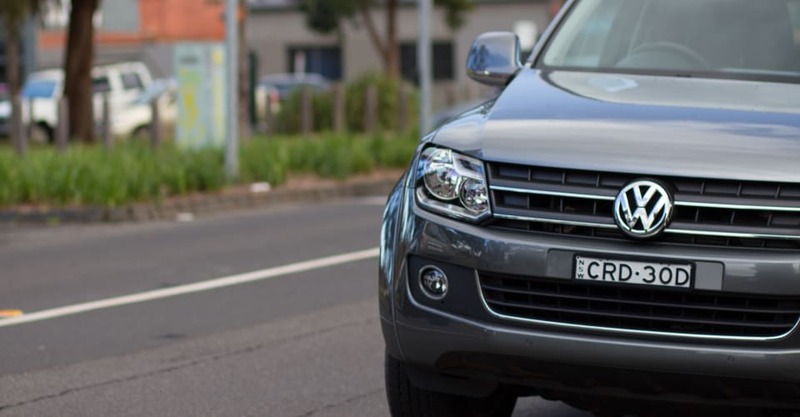 Bringing shopping home from the supermarket is also a bit of a pain – particularly with passengers on-board and when dealing with Melbourne’s notoriously fickle weather. Where do you put stuff? On the floor of the back seat? Fine when one up, but it’s not always practical. In the tray? Great if you shop at Costco and buy things by the palette, but Coles shopping bags don’t stay upright or full for too long. And be it raining or beating sun, that ute bed is not a happy place for a tub of Streets vanilla ice-cream. Then there’s the security factor. Sure you can spec an optional hard or soft tonneau cover, or even a custom lockable tool box for around $550, but each has its own compromises. 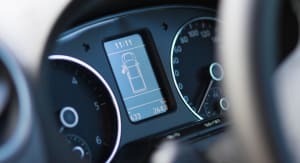 Whatever your choice, satisfactorily filling the jack-of-all-trades role a city-based family car demands, becomes an increasingly more complex task. The ute bed does give you a lot of room for aforementioned kite surfing equipment (providing you have them and don’t just wistfully browse online) but you can’t fit things like a full-size trail bike or even a medium-sized quad in there. 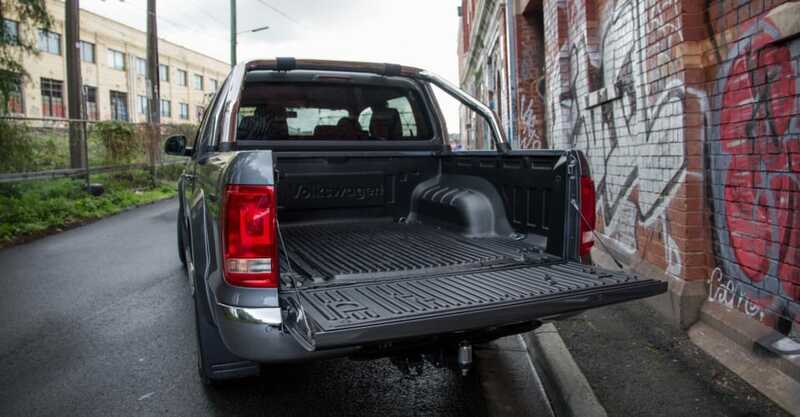 It might sound silly, but in my mind, that is the point of a full-size 4×4 ute. 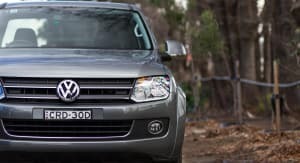 With the Amarok, you do get a three-tonne towing capacity – which means power toys, boats and vans can all come along – but unless you are pulling something really big, you can cover most towing needs with a smaller SUV wagon. 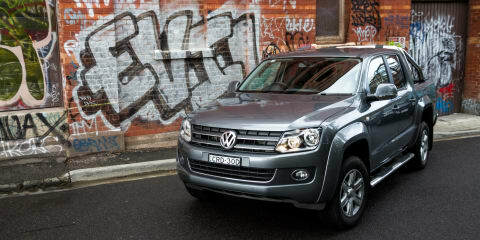 In all, the Volkswagen Amarok TDI420 Highline is a very good ute. 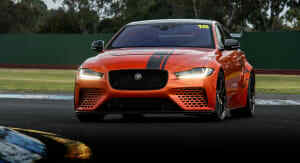 It looks good, drives well and is very easy to be in day-in, day-out. But as a substitute for an SUV wagon, it falls down in some key areas. The lack of side-rear airbags and limited rear legroom (good for the class but not versus a large SUV) limit the family appeal, and the day-to-day frustrations of storage and size make those weekend camping trips seem further away than ever. Yes, it is an excellent ute and if you need a vehicle to handle work then play (in that order) you will not be disappointed. 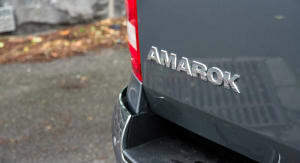 The Amarok is certainly the most civilised of its class, though as a style or lifestyle choice I would suggest trialling one for a few days to see if it fits with your world, or sticking with the more conventional wagon.